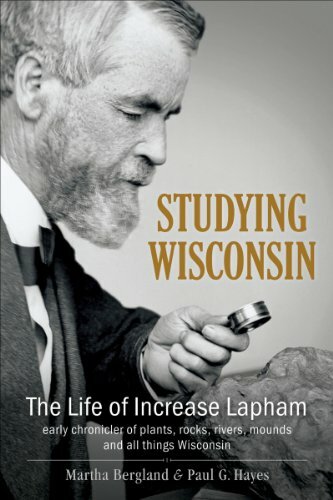 Join us for a joint meeting of the Kettle Moraine Chapter – Wild Ones and Kettle Moraine Land Trust with a presentation by Martha Bergland and Paul Hayes about their book, “Studying Wisconsin: The Life of Increase Lapham – Wisconsin’s Renaissance Man.” There will be door prizes and refreshments. Everyone is welcome and there will be no charge for attending. Lapham identified and preserved thousands of botanical specimens. He surveyed and mapped Wisconsin’s effigy mounds. He was a force behind the creation of the National Weather Service, lobbying for a storm warning system to protect Great Lakes Sailors. Studying Wisconsin chronicles the life and times of Wisconsin’s pioneer citizen-scientist. Martha Bergland, after retiring from teaching English at Milwaukee Area Technical College, wrote an article for Milwaukee Magazine on Increase Lapham. The research for this article became five years of research on the biography. Bergland has written many articles and short stories, as well as two novels, A Farm Under A Lake, and Idle Curiosity, both published by Graywolf Press. She lives in Glendale, Wisconsin. 511 Division Street, Mukwonago, WI, 53149, United States.